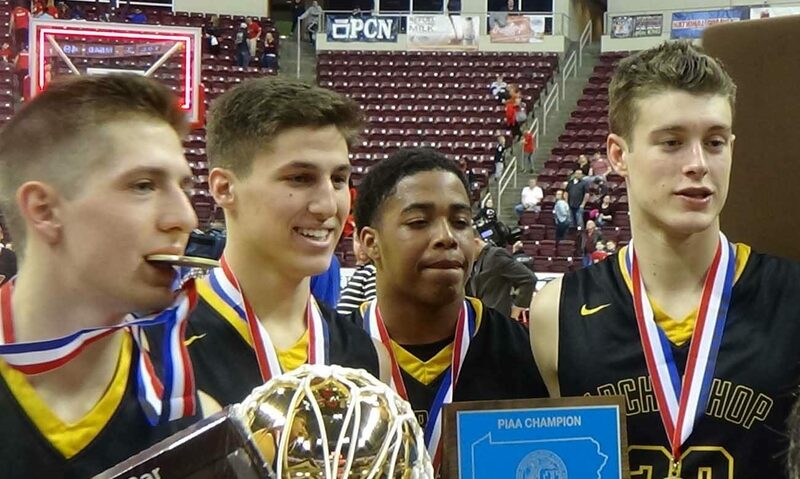 The New Year was anything but happy for Archbishop Wood’s basketball team. On Jan. 3, they dropped their Catholic League opener to Father Judge. Two days later, they lost their gym after a wall partially collapsed, rendering the venue too dangerous. 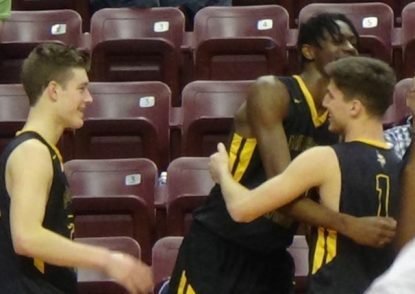 Fast forward to this past Friday night, March 24, at the Giant Center in Hershey, Pa.
For the 21st consecutive game since that 68-60 loss to Judge, the Vikings emerged victorious. 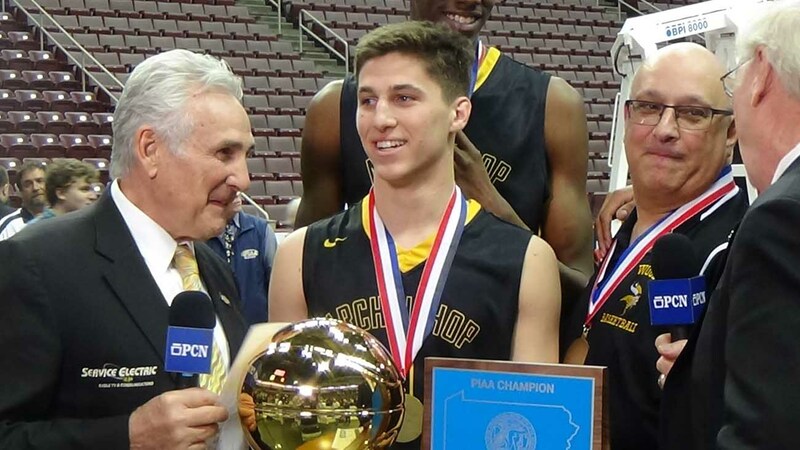 With every player on the roster experiencing playing time, Wood rolled to a 73-40 win over District 10 champion Meadville and captured its first-ever PIAA Class 5A state championship. 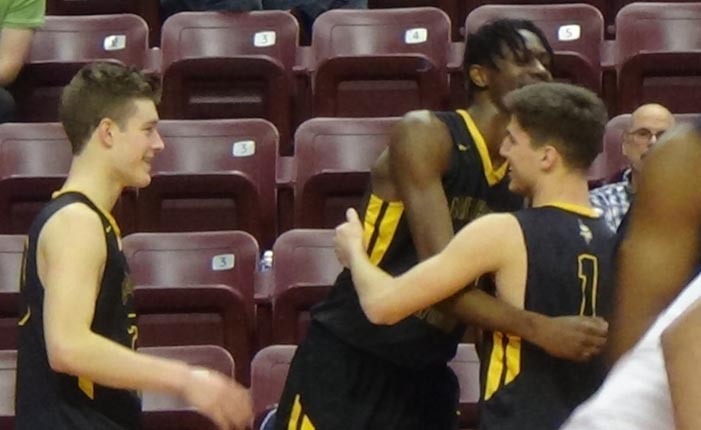 Along the journey was the school’s first-ever boys’ Catholic League title, a riveting victory over Neumann-Goretti that required climbing back from a big deficit. The Vikings also seized the District 12 crown and finished with a 28-3 overall record, the best in school history. Against Meadville, the Vikings dominated from the opening tip. They led, 17-5, after one quarter, and 40-21 at halftime. The 26-1 Meadville team appeared stunned. Pickron, a junior who eclipsed the 1,000-point career scoring plateau in a 71-46 quarterfinal win over Spring Grove, chose the ideal time to lead his team in scoring. His 18 points included five three-pointers on nine tries. With Gillespie (15 points, 10 rebounds), junior Seth Pinkney (11 points, 11 rebounds, four blocks), and junior Andrew Funk (10 points) providing most of the other offense, Wood coach John Mosco was presented a rare opportunity to provide minutes for each of the team’s 14 players on the roster. The final five players on the court for the last 1 minute, 22 seconds of the fourth quarter were freshman Chris Garland, freshman Zahree Harrison, sophomore Joe Wade, sophomore Bryce Stock and junior Kyle McNamee. Senior Matt Cerruti scored seven points and added three assists. At the midway point of the fourth quarter, Mosco took his starters out one by one. Each player embraced teammates and coaches on the bench while the seconds ticked away. With 2:55 left in the 2016-17 basketball season, Gillespie was substituted for Funk, and the Wood faithful cheered. It was a fitting gesture by Mosco to wait to take out his star player last. Gillespie credited several Wood graduates for establishing a winning expectation. Then he ended one of numerous interviews with a perfect summary. “We became close friends and bonded like a family,” said Gillespie. Congratulations to the boys team and the girls team for winning another state championship. Wood athletes have had a wonderful year athletically , because the football team won the states in the fall. Congratulations to all the coaches for the fine jon they do in coaching these youngsters.